Combining PET imaging with multi-parametric MR improves the accuracy of targeted prostate biopsies. Reston, Va. – A University of Michigan study published in the July issue of The Journal of Nuclear Medicine reports that the addition of molecular imaging based on F-18-choline positron emission tomography (PET) improves the identification of significant prostate cancer over multi-parametric prostate magnetic resonance imaging (mpMRI) alone for targeted transrectal prostate biopsies. MRI-guided biopsies already outperform standard, non-targeted biopsies. The addition of PET promises to improve targeted biopsies even further. According to the National Cancer Institute, approximately 14 percent of men will be diagnosed with prostate cancer at some point during their lifetime. More than 2.5 million men are estimated to be living with prostate cancer in the United States. As part of an ongoing prospective clinical trial, researchers studied 36 men with rising prostate-specific antigen (PSA) to assess the value of fusion F-18-choline PET/MRI for image-guided (targeted) prostate biopsies to detect significant prostate cancer, compared to standard (non-targeted, systematic 12-core) biopsies. The biopsy procedures were performed after registration of real-time transrectal ultrasound (TRUS) and included image-guided cores plus standard cores. Histological results were determined from standard and targeted biopsy cores, as well as prostatectomy specimens. Fifteen subjects were ultimately identified with significant prostate cancer (Gleason ≥ 3+4), of which targeted biopsy identified 12, while standard biopsy identified only five. 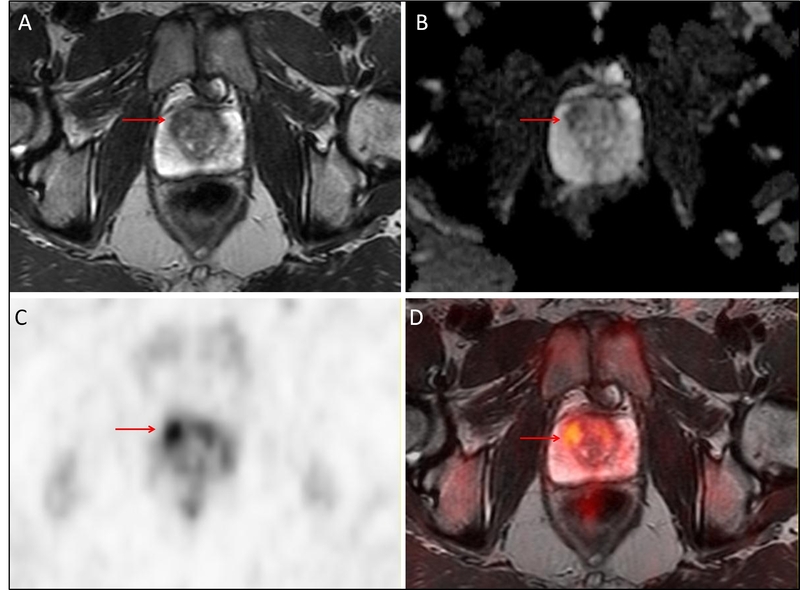 The figure shows a Gleason 3+4 prostate cancer (arrows) as identified on T2-weighted (A) and diffusion-weighted (B) MRI, F-18-choline PET (C), as well as PET/MRI (D). A total of 52 lesions were identified by mpMRI (19 low, 18 intermediate, and 15 high risk), and mpMRI-assigned risk was a strong predictor of final pathology (area under the curve (AUC) = 0.81; P < 0.001). Using the mean F-18-choline target-to-background ratio, the addition of F-18-choline to mpMRI significantly improved the prediction of Gleason ≥ 3+4 cancers over mpMRI alone (AUC = 0.92; p<0.001). The study concluded that fusion PET/MRI-TRUS image registration for targeted prostate biopsies is clinically feasible and accurate, and the addition of F-18-choline PET to mpMRI improves identification of significant prostate cancer. Authors of the article “18F-choline PET/MRI: The Additional Value of PET for MRI-guided Transrectal Prostate Biopsies” include Morand Piert, Jeffrey Montgomery, Lakshmi Priya Kunju, Javed Siddiqui, Virginia Rogers, Thekkelnaycke Rajendiran, Timothy D Johnson, Xia Shao, and Matthew S. Davenport, University of Michigan, Ann Arbor, Mich. This study was supported by grants from the Department of Defense (DOD), no. PC110389, and grants NIH/ NCI P01CA87634 and P50CA069568.